Would you like to contribute to Zayn’s Charity Drive, but feel like you can’t afford to donate much? Well regardless of the amount, The British Asian Trust is grateful for any contribution! No donation is too small. Here’s a great way to not only give what you can, but also to DOUBLE your donations! We are issuing a matching challenge titled Loose Change for Zayn! Courtney (ninicutiepie) has offered to match loose change donations for Zayn up to $100 a month! That means there could be an extra $100 raised for the charity per month!! So if you donate $5, then that means your donation will be doubled to $10. If you donate $10, your donation will be doubled to $20, and so on. 1. Dump out your purses, backpacks, coin jars, couch cushions, pockets, anywhere where you might have any “loose change.” Buy something and get “change.” Then take that and donate it here. 2. 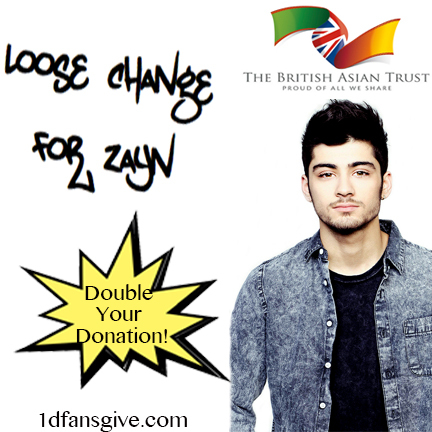 Add Loose Change for Zayn in your donation message to have your donation matched.